My childhood friend Alexia, her husband Olivier (they called themselves "A et O") and their cutie Alice finally went back to Paris on Monday. Olivier, who's an avid foodie, really enjoyed eating his way through California. One comment he made to me is that he noticed many savory dishes in California cuisine feature sweet notes. His remark inspired me to apply a touch of sweetness to seafood for today's meal. 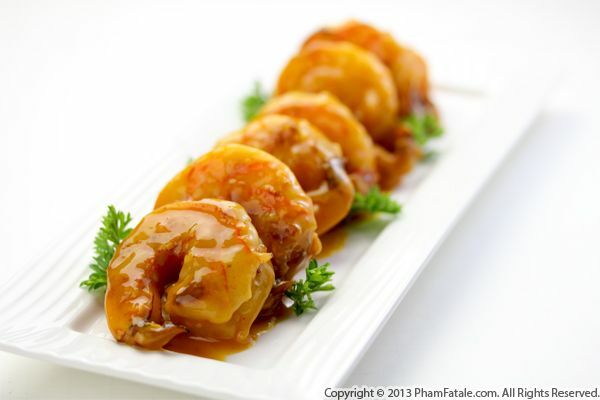 I pan-seared jumbo tiger shrimp, then coated them in a spicy, ginger-y mango sauce. I used it first as a marinade for the shrimp, then used the remainder to baste them to a sweet and spicy glaze. Chả tôm are lightly seasoned shrimp cakes. No tasteless fillers here; a sprinkling of tapioca starch, coriander, green onions, garlic and kaffir lime are the only ingredients added to supplement the flavor and texture of the shrimp. It is true Vietnamese comfort food. 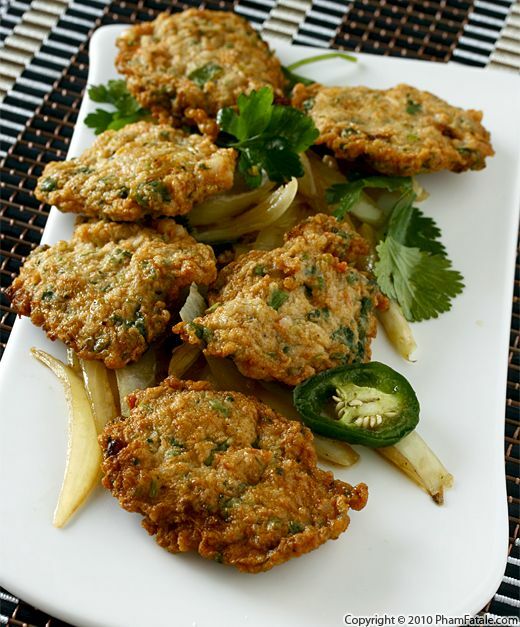 These shrimp cakes make wonderful appetizers, but can also be served as an entrée. Just pair them with vermicelli (called bún chả tôm) and you'll have yourself a very traditional Vietnamese meal. You could also make mini sandwiches for a change of pace. I served them recently as appetizers for a dinner party with a plum dipping sauce. They will be delicious no matter how you choose to prepare them!